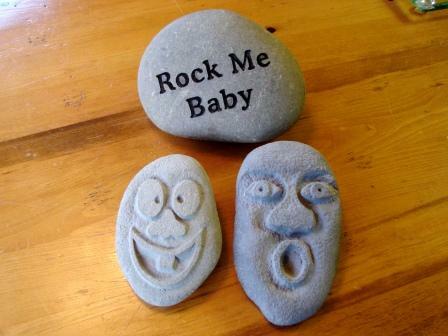 I just want to thank you for the beautiful art you did on Macy's memorial rock. It's perfect and we love it so much. 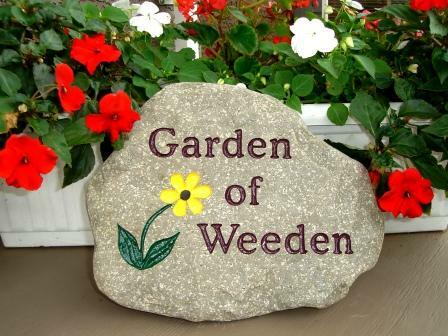 I have a perfect place for it in our garden, and when I put it in, I'll send you a picture. Thank you for your great communication with me and walking me thru every step of the way. I appreciate you sending the rock on my UPS account as well, that was nice of you to do that. I met with Mike to have a wedding gift made and it was fabulous. He took the time to talk with me, ask about what kind of gift, what meaning, and what I wanted to spend to make it special. From picking out the right stone and making sure it would work to sitting going through designs for the stone and font for the lettering/engraving, he went over and above. He took the symbol I was thinking off, a sun, did some tweaking of an already nice design and just made it, pardon the pun, shine! The detail in how he worked to space the lettering and everything showed in the final result. Most importantly, the people I gave the stone to loved it. Mike I love it, I really love the shape of the stone. Thank-you so much I will talk with you soon. Just wanted to let you know that the stone looks awesome. Thank you so much for doing such a great job and in a very quick time. the stone was so well done that they keep it in their livingroom. 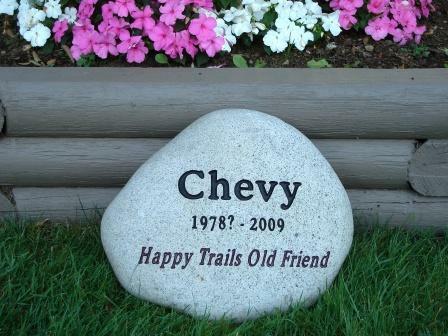 I have gotten several beautiful stones from Mike that are prominently displayed in my gardens next to the plant that I have planted in memory of the dog that I lost. They add a very nice accent to my gardens making them look very inviting. Many of my friends have commented on how good they look around our yard. 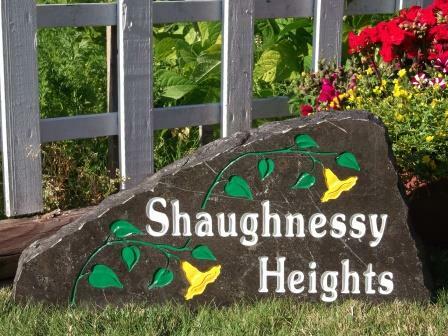 I have purchased stones for several of my friends who are thrilled to put the stones in their gardens too! Mike is great to work with and has always chosen a great stone for each one of the occasions that I have bought them for. 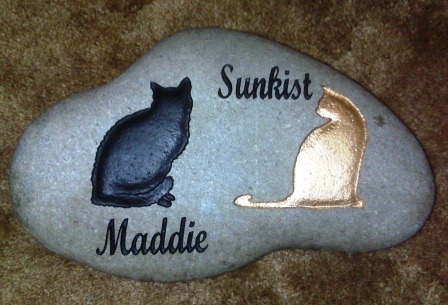 Thank you so much for the two stones you made for my mom last mother's day, she loved them and they brought her and everyone else to tears. I wasn't sure what I wanted but you helped figure it out and they turned out amazing. 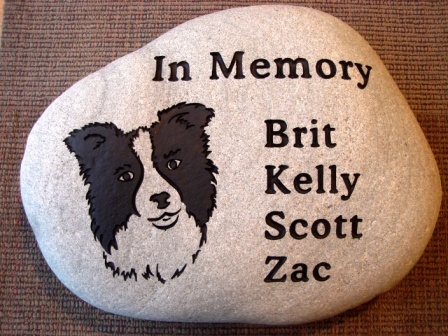 Thank you again for helping us keep our beloved pets memories alive. I will definitely be coming back in the future to get some more done! "I've used Mike's service a number of times. 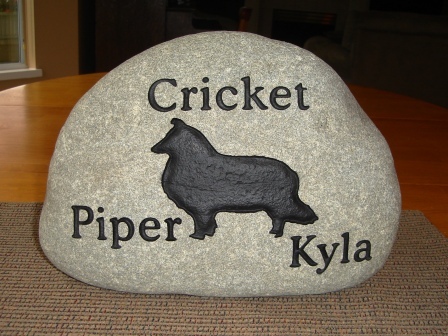 In both instances Mike had great personalized service to help me design the right stone and it was done right away. 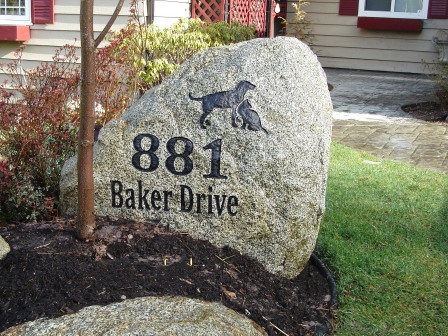 The finished stone products are unbelievable! 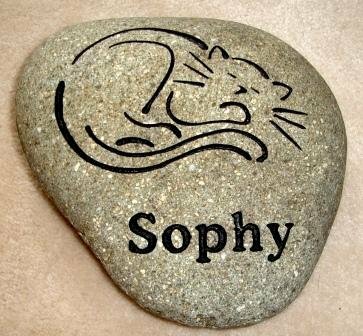 I gave both away as presents, they make amazing personal gifts, and both the recipients absolutely loved the stones I had made for them." 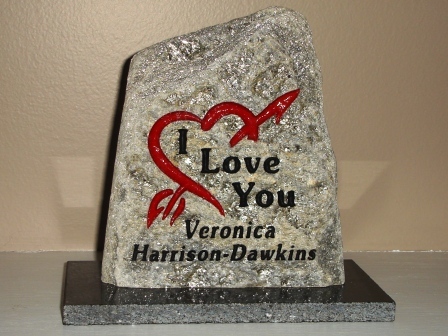 I'd like to thank you so very much for the memorial rock you engraved for me. 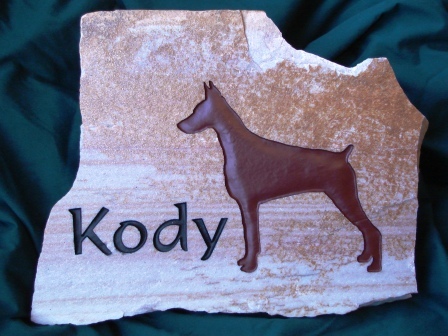 You captured exactly what I was looking for and I'll be happy to give it to my friend as a memorial to her beloved dog. 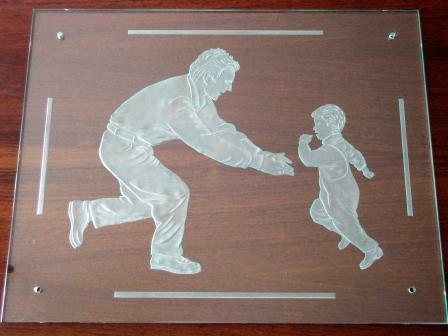 I know that she'll place it under his favourite tree in her yard and in time will smile when she looks at it. It was a pleasure dealing with you and you made it easy for me to make decisions and settle on the final product - thanks for that. 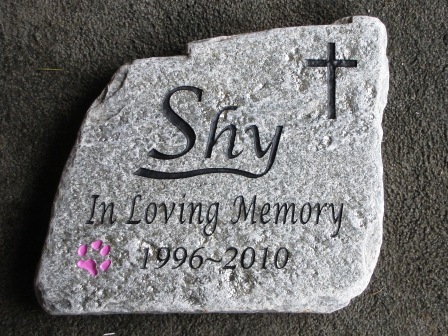 I'd be happy to recommend you to anyone looking for a memorial stone, garden art or remembrance plaque. 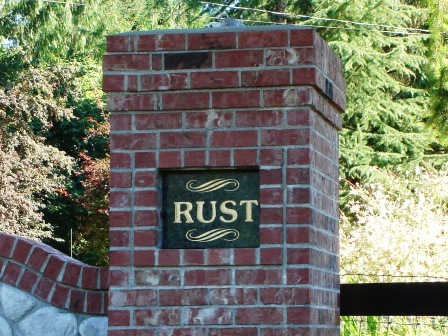 Thank you for our wonderful address stone. 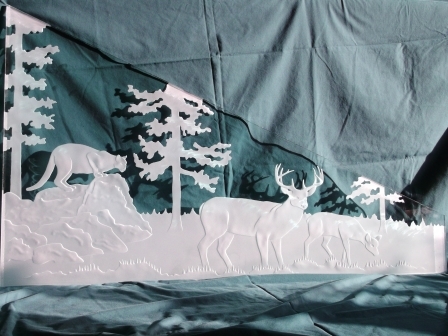 We have already received complements from neighbours and had people passing by express interest in your work. We even had a woman stop and take a few pictures with her phone so that she could show and share it with her husband. You were helpful and patient with me through the whole decision process. Your expertise and ideas were a huge help. We are thrilled with the finished result and happy to share it with friends. 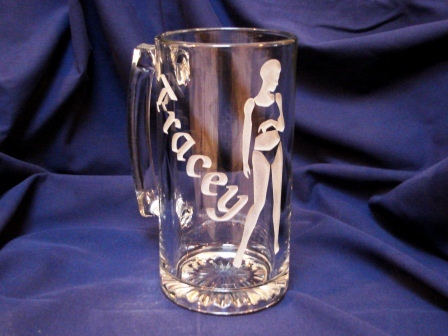 We will certainly be back to your business for gifts for family and close friends. 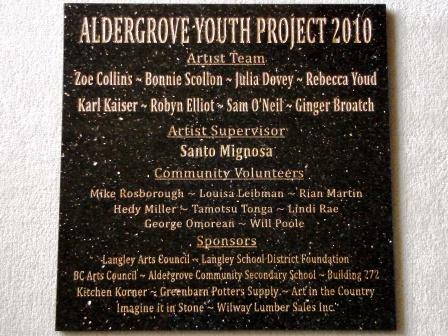 The granite plaque that Mike engraved for the Aldergrove Youth Project was an impressive commemoration for a distinctive ceramic mural, created by a student Team under the guidance of professional artist Santo Mignosa in the Fall and Winter of 2009. 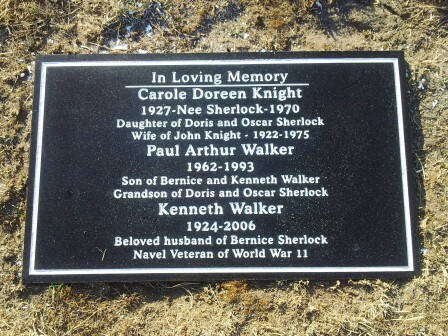 Now proudly installed on the Kitchen Korner building in Aldergrove, this plaque permanently honours both the students and the Community who supported them. 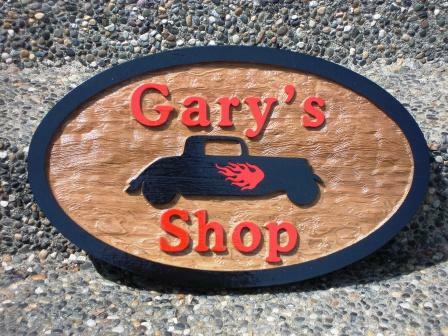 It was a rewarding experience to work with Mike in all phases of this Project. He is communicative, cheerful and attentive to detail; this is a rare find. I look forward to working with him again ! It was exactly what I was hoping to have displayed on my patio, and you did a very professional job. You offered excellent customer service, a fair price, and prompt delivery. I couldn't have asked for anything more, and I would highly recommend your work to my friends and family.